Today I'll point out a brace of recent research materials, all of which focus on the aging brain. A great deal of aging research is focused on the effects of aging in the brain, in part driven by the large level of investment in Alzheimer's disease research, and this overlaps with ongoing efforts to understand how the brain works: how it gives rise to the mind and how specific functional aspects of the mind work, all the way down to the level of proteins and intricate cellular structures such as synapses. While some researchers restrict themselves to investigation and observation, trying to fill in the large blank spaces on the map of the brain, others are working to find ways to repair some of the damage and reverse some of the declines. Forms of cell therapy are perhaps the closest to being broadly useful at the present time, but all sorts of ways to clear out cellular garbage and unwanted metabolic waste - such as the amyloid associated with Alzheimer's disease - are headed in the general direction of viability for clinical development. Not this year, but certainly within the next decade, new classes of treatment will arrive, therapies that can at least partially address some of the fundamental causes of functional decline in the aging brain, rather than trying to patch over the consequences as so much of present day medicine does. Initially these therapies will be highly restricted, available only in trials, or for patients in the late stages of neurodegenerative conditions. That is the outcome that the current regulatory system forces upon us. There will be a mild but sweeping revolution then, I hope, as treatments for the causes of aging become a reality, that will tear down the ridiculous systems of regulation that stifle development, with the result that effective therapies will become far less costly and far more widely available. A treatment that can address the causes of age-related disease is a treatment that should be undertaken by everyone on a regular basis, not just those who are heavily damaged by the processes of aging, and not just those groups that unaccountable bureaucrats decide should gain access. Today, the foundations for that future are still being built, one incremental step at a time, but is never too early to plan ahead. When neurons die, their remains need to be eliminated quickly so that the surrounding brain tissue can continue functioning. A type of highly specialised cell known as microglia is responsible for this process which is called phagocytosis. Neurons are known to die during the convulsions associated with epilepsy. But contrary to expectations, in this condition the microglia are "blind" and incapable of either finding them or destroying them. Their behaviour is abnormal. And the dead neurons that cannot be eliminated build up and damage the neighbouring neurons further, which leads to an inflammatory response by the brain which harms and damages it even further. This discovery opens up a new channel for exploring therapies that could palliate the effects of brain diseases. In fact, the research group that authored this work is right now exploring the development of drugs to encourage this cleaning up process, phagocytosis. The DNA damage response (DDR) is a complex biological system activated by different types of DNA damage. Mutations in certain components of the DDR machinery can lead to genomic instability disorders that culminate in tissue degeneration, premature aging, and various types of cancers. Intriguingly, malfunctioning DDR plays a role in the etiology of late onset brain degenerative disorders such as Parkinson's, Alzheimer's, and Huntington's diseases. For many years, brain degenerative disorders were thought to result from aberrant neural death. Here we discuss the evidence that supports our novel hypothesis that brain degenerative diseases involve dysfunction of glial cells (astrocytes, microglia, and oligodendrocytes). Impairment in the functionality of glial cells results in pathological neuro-glial interactions that, in turn, generate a "hostile" environment that impairs the functionality of neuronal cells. These events can lead to systematic neural demise on a scale that appears to be proportional to the severity of the neurological deficit. Researchers have successfully reduced the symptoms and slowed the progression of Huntington's disease in mice using healthy human brain cells. The research entailed implanting the animals with human glia cells derived from stem cells. One of the roles of glia, an important support cell found in the brain, is to tend to the health of neurons and the study's findings show that replacing sick mouse glia with healthy human cells blunted the progress of the disease and rescued nerve cells at risk of death. Conversely, when healthy mice were implanted with human glia carrying the genetic mutation that causes Huntington's, the animals exhibited symptoms of the disease. The researchers believe that the healthy human glia were able to essentially stabilize and perhaps even rescue neurons by restoring the normal signaling function that is lost during the disease. While strokes are known to increase risk for dementia, much less is known about diseases of large and small blood vessels in the brain, separate from stroke, and how they relate to dementia. Diseased blood vessels in the brain itself, which commonly is found in elderly people, may contribute more significantly to Alzheimer's disease dementia than was previously believed, according to new study results. The study analyzed medical and pathologic data on 1,143 older individuals who had donated their brains for research upon their deaths, including 478 (42 percent) with Alzheimer's disease dementia. Analyses of the brains showed that 445 (39 percent) of study participants had moderate to severe atherosclerosis - plaques in the larger arteries at the base of the brain obstructing blood flow - and 401 (35 percent) had brain arteriolosclerosis - in which there is stiffening or hardening of the smaller artery walls. The study found that the worse the brain vessel diseases, the higher the chance of having dementia, which is usually attributed to Alzheimer's disease. The increase was 20 to 30 percent for each level of worsening severity. The study also found that atherosclerosis and arteriolosclerosis are associated with lower levels of thinking abilities, including in memory and other thinking skills, and these associations were present in persons with and without dementia. The adult brain has some ability to adapt to changes in its environment. This ability is, in part, related to neurogenesis and gliogenesis. Neurogenesis modifies neuronal connectivity in specific brain areas, whereas gliogenesis ensures that myelination occurs and produces new supporting cells by generating oligodendrocytes and astrocytes. Altered neurogenesis and gliogenesis have been revealed in a number of pathological conditions affecting the central nervous system, indicating that modulation of the processes involved in adult neurogenesis and gliogenesis may provide a plausible strategy for treatment. Compared to neurogenesis, gliogenesis occurs more prevalently in the adult mammalian brain. Under certain circumstances, interaction occurs between neurogenesis and gliogenesis, facilitating glial cells to transform into neuronal lineage. Therefore, modulating the balance between neurogenesis and gliogenesis may present a new perspective for neurorestoration. These processes might be modulated toward functional repair of the adult brain. Researchers have shown that the dopamine D2 receptor is linked to the long-term episodic memory, which function often reduces with age and due to dementia. This new insight can contribute to the understanding of why some but not others are affected by memory impairment. In this study, a PET camera was used to examine individual differences in the D2 system in a group consisting of 181 healthy individuals between the age of 64 and 68. All participants also had to take part in an all-inclusive performance test of the long-term episodic memory, working memory and processing speed along with an MRI assessment (which was used to measure the size of various parts of the brain). Researchers could see that the D2 system was positively linked to episodic memory, but not to working memory or to processing speed by relating PET registrations to the cognitive data. Researchers could also see that the D2 system affects the functioning of the hippocampus in the brain, long linked to long-term episodic memory. The post Protected: ACADEMICS UPDATE FOR JULY 15, 2016 appeared first on Singularity University. Is Nuclear DNA Damage Responsible for Stem Cell Aging? Researchers here cast doubt on nuclear DNA damage as a primary cause of decline in the stem cell population that is responsible for creating immune cells and blood cells. All cell populations accumulate random mutations in nuclear DNA over the course of aging. It is well proven that this causes a rise in cancer risk, though as noted in the paper here that isn't a simple linear relationship. The consensus position is that this damage also contributes to degenerative aging in the form of increased disarray in cell operations, but there is no solid evidence to demonstrate that this is in fact so, nor to show the degree to which it is a cause of aging in comparison to other forms of damage. There are opposing viewpoints from those who suggest that nuclear DNA damage isn't in fact significant in aging beyond the matter of cancer, at least over the present human life span. The mammalian blood system consists of many distinct types of differentiated cells with specialized functions like erythrocytes, platelets, T-and B-lymphocytes, myeloid cells, mast cells, natural killer cells and dendritic cells. Many of these mature blood cells are short-lived and need thus to be replaced at a rate of more than one million cells per second in the adult human. This continuous replenishment depends on the activity of hematopoietic progenitor cells (HPCs) and ultimately hematopoietic stem cells (HSCs). HSCs numbers and HSCs potential are controlled via complex regulatory mechanisms involving tight molecular and cellular control of quiescence, self-renewal, differentiation, apoptosis, and localization as well as cell architecture. Under steady state conditions, HSCs are a largely quiescent, slowly cycling cell population, where only 8% of cells enter the cell cycle per day. However, in response to stress, HSCs exit quiescence and expand and differentiate. The mostly quiescent status of HSCs is thought to be a protective mechanism against endogenous stress caused by reactive oxygen species and DNA replication. In contrary to a common assumption that cell loss is tightly associated with aging, the number of phenotypic HSCs actually increases in both mouse and humans. In the aged bone marrow, there are two- to ten-fold more HSCs present when compared to young. Aged HSCs show under stress, like for example in serial transplantation assays, a diminished regenerative potential as consequence of a lower long-term self-renewal capacity. Aging-associated changes can be attributed at least in part to aging of HSCs. Aged HSCs are deficient in their ability to support erythropoiesis and show a markedly decreased output of cells from the lymphoid lineage, whereas the myeloid lineage output is maintained or even increased compared to young HSCs. A controversially discussed cell-intrinsic factor driving HSC aging is DNA damage. HSCs are responsible for maintaining tissue homeostasis throughout a lifetime. It is therefore critical for HSCs to maintain their genomic integrity to reduce the risk of either BM failure or transformation. The paradigm of the DNA damage theory of stem cell aging states that aging-associated changes in the DNA repair system in HSCs, together with changes in cell cycle regulation due to increased DNA damage with age, are thought to result in elevated DNA mutations, which then causally contribute to the decrease in HSCs function with age. However, genetic engineering of mutations in most of the genes linked to DNA damage response so far did not result in the "aging-characteristic" initial expansion of the number of phenotypic HSCs, rendering a central role for these genes and the pathways they represent with respect to physiological aging of the hematopoietic system not likely. Data confirms a mild 2-3 fold aging-associated increase in the mutation frequency in hematopoiesis, the increase though is linear and not exponential with respect to age, rendering a cause-consequence relationship to the exponential increase of leukemia upon aging unlikely. Modeling of aging of HSCs populations based on evolutionary theories also demonstrates that accumulation of genetic changes within HSCs are not sufficient to alter selectivity and fitness of HSCs, and identified non-cell autonomous mechanisms, aka changes in the stem cell niche, as the major selective driving force for aging-associated leukemia. Such conclusions are also supported by the observation that while a 22-fold increase in the mutational load initiated cancer, a modest 2-3 fold increase in mutational load did not result in leukemia initiation. Finally, novel data from our laboratory demonstrated that the quality of the DNA damage response in HSCs does not change upon aging. Since the accumulation of DNA mutations in HSCs upon aging might not be directly linked to the functional decline of HSCs with age and an aging-associated exponential increase in the incidence of leukemia, what other mechanisms might contribute to these phenotypes? It could already be shown that aging of the HSCs niche and environment plays an important role in selecting and expanding normal and pre-leukemic HSC and HPC clones upon aging. Thus the concept of adaptive landscapes has been recently developed. In this concept, the niche environment of HSCs changes upon aging, influencing the functionality of HSCs. The mutations acquired over time might not influence the HSC per se. In addition to extrinsic factors also intrinsic alterations that are not mutations in DNA might ultimately contribute to HSCs aging. We have recently reported that HSCs change their polarity upon aging, both in the cytoplasm and the nucleus. It might thus be possible that also changes in the general architecture of the cell might contribute to HSC aging. Changes in the 3D arrangement of epigenetic marks and structural proteins might influence for example cell divisions in a way that reduces potential in daughter stem cells, contributing to intrinsic HSC aging. In summary, multiple mechanisms might contribute to aging of HSCs, and ultimately depend on the interplay between cell extrinsic and cell intrinsic factors. It is known that greater levels of education correlate with greater life expectancy, but the novelty in the research here is a matter of just how far back in history this correlation can be shown to exist - it isn't dependent on access to very modern medicine. This is a part of a web of correlations between social status, intelligence, wealth, and education, all of which associate with modestly greater longevity. The underlying mechanisms and their relative importance remain debated; it seems easy to argue for wealth to grant relatively greater access to medicine, for example, but there is also evidence to link intelligence with greater physical robustness. Ultimately the point of building rejuvenation therapies is to make all of this irrelevant, however: for everyone to be able to live for as long as desired in perfect health, regardless of the hand dealt by chance and genetics. By using historical data on about 50,000 twins born in Sweden during 1886-1958, we demonstrate a positive and statistically significant relationship between years of schooling and longevity. This relation remains almost unchanged when exploiting a twin fixed-effects design to control for the influence of genetics and shared family background. This result is robust to controlling for within-twin-pair differences in early-life health and cognitive ability, as proxied by birth weight and height, as well as to restricting the sample to monozygotic twins. The relationship is fairly constant over time but becomes weaker with age. Literally, our results suggest that compared with low levels of schooling (less than 10 years), high levels of schooling (at least 13 years of schooling) are associated with about three years longer life expectancy at age 60 for the considered birth cohorts. The real societal value of schooling may hence extend beyond pure labor market and economic growth returns. From a policy perspective, schooling may therefore be a vehicle for improving longevity and health, as well as equality along these dimensions. In an advance that helps pave the way for next-generation electronics and computing technologies — and possibly paper-thin devices — scientists with the U.S. Department of Energy’s Lawrence Berkeley National Laboratory (Berkeley Lab) have developed a way to chemically assemble transistors and circuits that are only a few atoms thick. In addition, their method yields functional structures at a scale large enough to begin thinking about real-world applications and commercial scalability. They reported their research online July 11 in the journal Nature Nanotechnology. The scientists controlled the synthesis of a transistor in which narrow channels were etched onto conducting graphene, and a semiconducting material called a transition-metal dichalcogenide (TMDC) was seeded in the blank channels. Both of these materials are single-layered crystals and atomically thin, so the two-part assembly yielded electronic structures that are essentially two-dimensional, and cover an area a few centimeters long and a few millimeters wide. “This is a big step toward a scalable and repeatable way to build atomically thin electronics or pack more computing power in a smaller area,” says Xiang Zhang, a senior scientist in Berkeley Lab’s Materials Sciences Division who led the study. Their work is part of a new wave of research aimed at keeping pace with Moore’s Law, which holds that the number of transistors in an integrated circuit doubles approximately every two years. To keep this pace, scientists predict that integrated electronics will soon require transistors that measure less than ten nanometers in length. “With silicon, this will be extremely challenging, because the thickness of the transistor’s channel will become greater than the channel length, ultimately leading to difficult electrostatic control via the transistor gate,” the authors note. Nanomaterials such as inorganic nanowires and Stanford/IBM’s carbon nanotubes have been proposed, but require impractical “precise placement and orientation using complex fabrication techniques,” the authors point out. So researchers have now looked to two-dimensional crystals that are only one molecule thick as alternative materials to keep up with Moore’s Law. 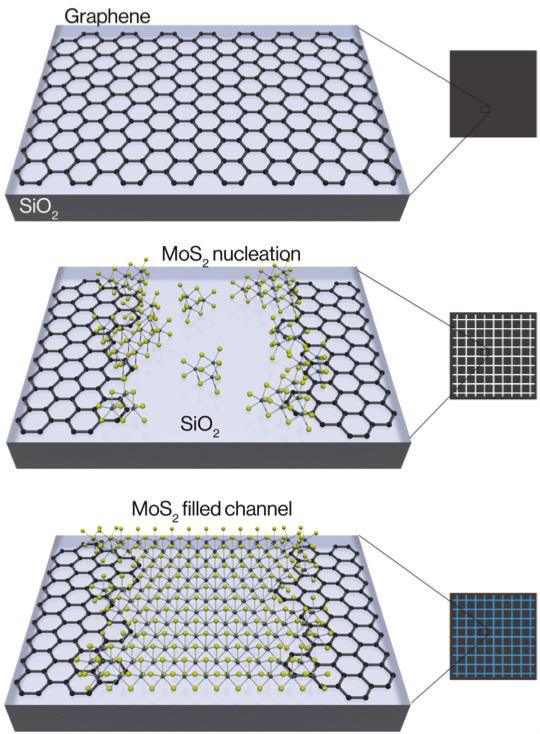 Using that approach, the Berkeley Lab scientists developed a way to seed a single-layered semiconductor — in this case, the TMDC molybdenum disulfide (MoS2) — into channels lithographically etched within a sheet of conducting graphene. The two atomic sheets meet to form nanometer-scale junctions that make atomically thin transistors in which the graphene conductor efficiently injects current into the MoS2. “This approach allows for the chemical assembly of electronic circuits, using two-dimensional materials, which show improved performance compared to using traditional metals to inject current into TMDCs,” says Mervin Zhao, a lead author and Ph.D. student in Zhang’s group at Berkeley Lab and UC Berkeley. The scientists demonstrated the usefulness of the structure by assembling it into the logic circuitry of an inverter (NOT gate). This further underscores the technology’s ability to lay the foundation for a chemically assembled atomic computer, the scientists say. They also note that the two-dimensional crystals were synthesized at a wafer scale, so the scalable design is compatible with current semiconductor manufacturing. The research was supported by the Office of Naval Research and the National Science Foundation. Scientists from Cornell University were also involved in the research. Next-generation electronics calls for new materials beyond silicon, aiming at increased functionality, performance and scaling in integrated circuits. In this respect, two-dimensional gapless graphene and semiconducting transition-metal dichalcogenides have emerged as promising candidates due to their atomic thickness and chemical stability. However, difficulties with precise spatial control during their assembly currently impede actual integration into devices. 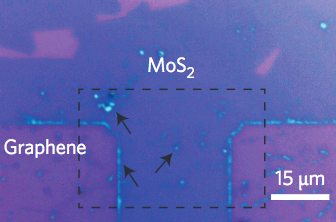 Here, we report on the large-scale, spatially controlled synthesis of heterostructures made of single-layer semiconducting molybdenum disulfide contacting conductive graphene. Transmission electron microscopy studies reveal that the single-layer molybdenum disulfide nucleates at the graphene edges. We demonstrate that such chemically assembled atomic transistors exhibit high transconductance (10 µS), on–off ratio (∼106) and mobility (∼17 cm2 V−1 s−1). The precise site selectivity from atomically thin conducting and semiconducting crystals enables us to exploit these heterostructures to assemble two-dimensional logic circuits, such as an NMOS inverter with high voltage gain (up to 70). The Allen Institute for Brain Science today announced the release of the Allen Brain Observatory. The Allen Institute is known for its comprehensive brain atlases, with deep, high-quality data sets revealing where genes are expressed and how cells and connections are arranged in the mouse and human brain, according to Allan Jones, Ph.D., CEO of the Allen Institute. With this new project, the researchers took a clever approach, combining a large variety of visual stimuli, including film clips and moving images, with the associated responses of neurons in four areas of the mouse visual cortex at multiple depths, sampling more than 18,000 neurons in total. The goal is to determine the “tuning,” or preference, of each individual neuron to visual features like motion and shape orientation, as well as complex images like natural scenes and movies that reveal integrative dynamics of visual processing. The data are presented as part of the suite of Allen Brain Atlas tools in the uniform and shareable Neurodata Without Borders file format, which allows scientists anywhere to easily mine and model the data. (The mouse is an important model system often used to understand the far less accessible and far larger human brain.) The data are presented in a novel visualization format through the Allen Brain Atlas data portal, and are accompanied by analysis tools and access to all raw data, which allows scientists to deeply explore the rules that govern how networks of cells in the visual cortex communicate. “The Allen Brain Observatory is a stunning window into the visual brain of the mouse,” says Christof Koch, Ph.D., President and Chief Scientific Officer of the Allen Institute for Brain Science. “No one has ever taken this kind of standardized approach to surveying the active brain at cellular resolution in order to measure how the brain processes information in real time. This is a milestone in our quest to decode how the brain’s computations give rise to perception, behavior, and consciousness. Understanding visual processing is a key gateway to understanding how other parts of the brain process information, and future releases of the Allen Brain Observatory will also explore the neural circuits that underlie more complex behaviors like decision-making, according to the researchers. Today I'll point out a great open access paper on the evolution of human telomere dynamics: telomere length, how that length changes over time, and especially how it changes with aging. This makes a good companion piece to another paper from last week that covered the differences in telomere dynamics between mice and humans. This is quite important, since most of the work on this topic involves mouse studies, not human studies. As telomerase gene therapies continue to extend average telomere length and - in mice at least - also extend healthy life span, this is becoming a hot topic in the aging research community. It is increasingly a good idea to have a grounding of the basics and current scientific thinking on this portion of our biochemistry. Sooner or later someone will be selling telomerase gene therapies to the public as an alleged method to slow the progression of aging, and most likely selling these treatments well in advance of any comprehensive human studies or definitive answers as to their effectiveness. You will find yourself in the position of deciding whether or not to pay the price and undertake the therapies. Better to figure out your position and what would change your mind today rather than later. Telomeres are repeating sequences of DNA that cap the ends of chromosomes. Their purpose is primarily to act as a part of the limiting mechanisms on cell replication: a little of the length is lost with each cell division, and when they become too short the cell self-destructs or becomes senescent, ceasing replication. For any given tissue the distribution of telomere length among cells is a function of how often new cells with long telomeres are created by stem cells, and how often cells divide. Stem cells maintain long telomeres through the use of telomerase, which adds more repeating sections to replace those lost to cell division. In humans only stem cells use telomerase, but in mice it has a much more widespread activity. Mice also have much longer telomeres than humans. All of this has everything to do with cancer, of course. The whole complicated arrangement of cells that are limited coupled to a much smaller number of cells that are privileged has evolved because it limits uncontrolled growth sufficiently well for evolutionary success. Without it highly structured and comparatively long-lived species such as our own couldn't exist. Since stem cell activity declines with aging, it isn't surprising to see that measures of average telomere length also tend to do so - but this is a very poor measure of aging, and really only shows up in statistical studies across populations. There are too many other influences over the most commonly measured types of cell, such as immune cells. So average telomere length, much discussed this past decade, looks a lot like a measure of age-related damage, far removed from root causes. Given that, why does increased telomerase activity extend life in mice? Most likely for the same reasons that any method of spurring greater stem cell activity improves matters in an old individual: greater tissue repair and maintenance, a net benefit even if it is old and damaged cells that do the work. There are also other, less well explored activities undertaken by telomerase that might be beneficial, such as improvements in mitochondrial function. In mice at least it seems that these benefits come with no greater risk of cancer. It may be that improved immune function destroys more potential cancers than are created through greater activity in age-damaged cell populations, but that is pure speculation at this point. For humans the effects on cancer risk are much more of a question mark, though it is worth noting that stem cell therapies to date have exhibited far less risk of cancer than was expected at the outset. Modern humans, the longest-living terrestrial mammals, display short telomeres and repressed telomerase activity in somatic tissues compared with most short-living small mammals. The dual trait of short telomeres and repressed telomerase might render humans relatively resistant to cancer compared with short-living small mammals. However, the trade-off for cancer resistance is ostensibly increased age-related degenerative diseases, principally in the form of atherosclerosis. Telomere length genetics should be considered in the context of evolutionary forces that have left their signature on the human genome. Inspection of the human genome reveals that of the approximately 22,000 currently annotated genes, 13,000 genes (about 60%) are linked to biological pathways of "cancer". These include genes engaged in growth, development, tissue regeneration, and tissue renewal, which heighten cancer risk due to increased cell replication, and genes that suppress cancer, including those that ultimately promote senescence and apoptosis. Central among cancer-protective pathways might be telomere-driven replicative senescence. Stem cells are likely to undergo more replications in large, long-living mammals than in small, short-lived ones; this is because more replications are necessary for developing and maintaining a larger body size. More cell replication confers increased risk of cancer through accumulating de novo somatic mutations, which happen during successive DNA replications. This concept is supported by work showing that the risk of developing major human cancers is related to the number of stem cell divisions occurring in the tissues from which the cancers originated. Yet, large, long-living mammals generally display no increase in cancer risk compared to small, short-lived ones, a phenomenon known as Peto's paradox, suggesting that mechanisms have evolved to mitigate cancer risk in tandem with increasing body size and longevity. One such mechanism has been described in elephants. The elephant genome contains many more copies of TP53, a potent DNA damage response and tumor suppressor gene; p53-dependent apoptosis is thus triggered at a lower threshold of accumulating mutations, conferring cellular resistance to oncogenic transformation. Similarly, a telomere-linked mechanism has been proposed in mammals based upon observations that telomerase activity in somatic tissues tends to be inversely correlated with body size while telomere length is inversely related to lifespan. Repressed telomerase and short telomeres would, therefore, limit replicative capacity in humans. In this way, short telomere length might curb the accumulation of de novo mutations and reduce the probability of oncogenic transformation in large, long-living mammals. Given the wide variation in telomere length across humans, might longer telomeres increase cancer risk? While initial studies were inconsistent (perhaps partially due to flaws in study design and small sample sizes), more recent studies show that in individuals of European ancestry, long telomeres, as expressed in leukocyte telomere length (LTL), are associated with increased risk for melanoma, adenocarcinoma of the lung, and cancers of the breast, pancreas, and prostate. Moreover, Mendelian randomization studies using leukocyte telomere length associated SNPs support the inference that having a longer LTL has a causal relation to cancer risk. The cancer protection conferred by short telomeres could come with an evolutionary trade-off, namely, diminished proliferative activity of stem cells and consequently less regenerative capacity. This would manifest in age-dependent degenerative diseases. Some of the leading degenerative diseases in humans are related to atherosclerosis, and atherosclerosis is associated with short LTL. As cancer and atherosclerosis strongly impact longevity, the diametrically opposing roles of TL in these two disorders might be relevant to understanding the lifespan of contemporary humans and future trajectories in life expectancy. Notably, in evolutionary terms, this would probably have become more relevant when agrarian societies emerged over the past ten thousand years or so and lifespans increased considerably. In fact, evidence of atherosclerosis has been detected in ancient human Egyptian mummies. Recent studies have used LTL genome-wide association study findings to generate "genetic risk scores" for cancers and for atherosclerosis insofar as it is expressed in coronary heart disease. These studies have shown that the same cluster of LTL-associated alleles is a risk indicator for melanoma, lung cancer, and coronary heart disease, such that when the joint effect of the alleles results in a comparatively long LTL, the risk for melanoma and lung cancer is increased, whereas the risk for coronary heart disease is diminished. The opposite holds when the joint effect of the alleles results in a comparatively short LTL, which engenders a higher risk for coronary heart disease and a lower risk for cancer. This cancer-atherosclerosis trade-off might principally apply to contemporary humans because they live so long, but not to ancestral humans. This trade-off has been principally established through the force of evolution. In contrast to cancer, which is associated with over ten thousand genes, only several hundred genes in the human genome have been shown to relate to atherosclerosis. Yet, atherosclerosis is a major determinant in the longevity of humans because of their relatively long lifespan, especially in high- and middle-income societies. Juno Therapeutics, Inc. announced July 7 that it has received notice from the FDA that it has placed a clinical hold on an immune-cell cancer treatment known as the “ROCKET” trial, which was reported on KurzweilAI on Mar. 10, 2016. The clinical hold was initiated after two patient deaths, which followed the recent addition of fludarabine to the pre-conditioning regimen. Juno has proposed to the FDA to continue the ROCKET trial using JCAR015 with cyclophosphamide pre-conditioning alone. In transthyretin amyloidosis, also known as senile systemic amyloidosis when it occurs in the elderly, the protein transthyretin misfolds to precipitate into solid masses. This occurs to varying degrees over the course of aging for all of us, and it is becoming clear that these amyloid aggregates contribute meaningfully to the progression of heart disease, among other conditions. It also seems that transthyretin amyloidosis is what finally kills most supercentenarians, the oldest of people who evade every other fatal age-related condition. The tetrameric thyroxine transport protein transthyretin (TTR) forms amyloid fibrils upon dissociation and monomer unfolding. The aggregation of TTR causes life-threatening transthyretin amyloidosis (ATTR) associated with three conditions traditionally known as senile systemic amyloidosis, familial amyloidotic polyneuropathy, and familial amyloidotic cardiomyopathy. Senile systemic amyloidosis is a late onset disease in which wild-type (WT) TTR aggregates, weakening the heart muscle. Senile systemic amyloidosis is usually diagnosed by post-mortem exams of patients over 80 years old. Familial amyloidotic polyneuropathy and familial amyloidotic cardiomyopathy are hereditary conditions characterized by extracellular deposition of TTR amyloid fibrils in the peripheral nerves and heart, respectively, which leads to system failure. Currently, there is no cure for transthyretin amyloidosis, and the treatment for familial cases of ATTR is liver transplantation. Tafamidis, a TTR tetramer stabilizer, has been recently approved in Europe; it delays progression of the disease. Several other therapeutics are currently in clinical trials, including other tetramer stabilizers such as diflunisal and RNAi therapies that cause a decrease in the production of TTR protein. Additional approaches are needed to prevent ATTR, and here we explore the use of peptide inhibitors that block aggregation of TTR. Several models of the TTR amyloid spine have been proposed, but the aggregation-prone segments of the protein remain uncertain. Based on the studies of crystal structures of amyloid-driving segments, our group has proposed that fibrils can form through intermolecular self-association of one to several fibril-driving segments. Identical segments from several protein molecules stack into steric zipper structures, which form the spine of the amyloid fibril through tightly interdigitated β-sheets. Here we identify two segments of TTR that drive protein aggregation by self-association and formation of steric zipper spines of amyloid fibrils. Based on the amyloid structure of these two segments, we designed two peptide inhibitors that halt the progression of TTR aggregation. I mentioned Project|21 in yesterday's announcement of Michael Greve's $10 million pledge to SENS rejuvenation research and development, but I think it merits its own post. Not so very long ago the SENS Research Foundation engaged a specialist in high-end medical non-profit fundraising, and Project|21 is the outgrowth of that relationship, a program to raise the millions needed to take the first SENS therapies to readiness for human clinical trials over the next five years. To get to the point at which such a program is possible and practical required the years of groundwork and grassroots support that we as a community have provided: large donations always follow the crowd, and high net worth donors require advocates and thousands of supporters to light the way - and to continue those efforts. In effect, this launch of Project|21, alongside the advent of the first startups working on senescent cell clearance, marks a transition to a new stage of development for rejuvenation research following the SENS vision of repairing the cell and tissue damage that causes aging. Congratulations are due all round. SENS Research Foundation today announced its Project|21 campaign to secure $50 million in private support from individual donors, foundations, and corporations. The goal of Project|21 is for SRF to partner with a new generation of visionary philanthropists, build the Rejuvenation Biotechnology industry, and bridge the most challenging gulf between research and treatment by enabling human clinical trials by 2021. Aubrey de Grey, founder and chief science officer of SENS Research Foundation said, "Ending aging will require large-scale investment to flow into a globally-recognized industry for rejuvenation biotechnology. Since we began in 2009, SENS Research Foundation has been putting all the pieces in place - core research groups, key players, shared knowledge, underlying tools - for the creation of this industry. The key programs funded by Project|21 can create an environment where the first damage repair interventions addressing specific age-related diseases will be brought to human clinical trials within five years." The programs funded under Project|21 focus on three major barriers to the development of truly effective rejuvenation therapies. First, funding to convert promising basic research programs into solid investment candidates remains far too scarce. Second, there are too few opportunities for dynamic collaborations with mainstream regenerative medicine. Finally, there is little understanding of the regulatory pathways and clinical infrastructure these technologies will require. Project|21 addresses these three areas by creating a $15 million bridge fund to support promising early stage technologies; a center of excellence to deliver better opportunities for collaborative development of early stage programs; and a Rejuvenation Biotechnology Alliance Program to address challenges in regulation, manufacturing, and investment. The first donation received for Project|21 is a commitment from German internet entrepreneur Michael Greve's Forever Healthy Foundation for $5 million in philanthropic support over the next five years. In addition Michael Greve's company KIZOO Technology Ventures will be committing seed investments of $5 million in startups focused on bringing rejuvenation biotechnology treatments to market. Michael Greve is an internet entrepeneur turned venture capitalist with a long-standing interest in aging and longevity, and today he has pledged $10 million in support of SENS rejuvenation research: $5 million for the science, and a further $5 million to fund startups for clinical development. This money will help speed the development of therapies that can repair the forms of cell and tissue damage that cause aging, and thus prevent age-related disease, rejuvenate the old, and significantly extend healthy life spans. Michael Greve runs the Forever Healthy Foundation and the Kizoo venture fund, and has become ever more involved in the SENS rejuvenation research community over the past few years. If you attended any of the recent SENS conferences you might have met him. He was one of the generous matching fund donors for last year's Fight Aging! SENS fundraiser, and this year his venture fund has invested in companies Oisin Biotechnology and Ichor Therapeutics, both of which are carrying out the clinical development of biotechnologies relevant to the SENS approach. I'm very pleased to see that Michael Greve has now joined the ranks of those who have committed a significant amount of funding to SENS research, alongside Aubrey de Grey, Peter Thiel, and Jason Hope. As more people in the venture community demonstrate their public, material support for this path forward, I think that we're going to see greater interest from that quarter. This is something that the SENS Research Foundation has been building towards since its inception, as it is no accident that the organization is headquartered in the Bay Area. The $5 million that Greve has pledged to research will be the founding donation for Project|21, which is the new SENS Research Foundation high-level fundraising program aiming to pull in exactly this sort of support: millions for specific programs, to complete the first prototype SENS rejuvenation therapies and push this industry into existence. You'll be hearing a lot more of this in the years ahead. As you look at this important step forward in the movement to bring aging under medical control, consider that we all helped to make this happen, to persuade people like Michael Greve that this is the right place to invest in progress. Without the community of grassroots support and activism, without our voices and our own modest donations, without the writing and the crowdfunding and the discussions, without the simple step of talking to your friends about ending aging, we could never have gained the interest of people who can devote millions to the causes they believe in. A movement is a process, a collaboration. Today we can celebrate, and I think it is clear that this is but the start of far greater growth and success to come in the years ahead. German Internet Entrepreneur Michael Greve today announced that his Forever Healthy Foundation will be committing $5 million in philanthropic support over the next five years to the SENS Research Foundation (SRF), a non-profit organization focused on transforming the way the world researches and treats age-related disease. In addition Michael Greve's company KIZOO Technology Ventures will be committing seed investments of $5 million in startups focused on bringing rejuvenation biotechnology treatments to market. "My goal is to provide support for the critical research of the SENS Research Foundation and to facilitate the development of the rejuvenation biotech industry and ecosystem. I think we should have more people contribute to the step-by-step creation of cures for the root causes of all age-related diseases. And we should have a whole rejuvenation industry based on the SENS treatment model including the self-accelerating feedback-loop of success stories and amazing opportunities for scientist, entrepreneurs and VC investors. This will truly accelerate both research and therapies. I have decided to lead by example and make this $10 million commitment," said Michael Greve. Forever Healthy Foundation's initial donation will fund projects including Allotopic Expression of Mitochondrial Genes led by Dr. Matthew O'Connor at the SENS Research Foundation Research center and Pharmacological and/or enzymatic cleavage of glucosepane crosslinks led by Dr. David Spiegel at Yale University, SENS Research Foundation's Education Program led by Dr. Greg Chin and other SENS Research Foundation programs. "Michael Greve's commitment shows that there is clear support for the critical work of the SENS Research Foundation. As the first donation in our Project|21 fundraising campaign, it will help enable us to build a bridge to the first human clinical trials of Rejuvenation Biotechnologies by 2021. This gift is an important cornerstone that we will be able to build upon," said Mike Kope, CEO, SENS Research Foundation. Project|21 is a new initiative created by SENS Research Foundation to end age-related disease through human clinical trials, starting in 2021, through investment in rejuvenation biotechnology. We have all the pieces in place - core research groups, key players, shared knowledge, and underlying tools - for the creation of this industry. Through three new programs, the Bridge fund, The Center of Excellence, and The Alliance Program, Project|21 will deliver the perfect environment for this fusion of opportunity and investment. With proper stewardship of this emerging industry, we can create an environment where the first damage repair interventions to address specific age-related disease will be brought to human clinical trials within five years. $50 million in total funding is required for Project|21, at least half of which will come from the members of SENS Research Foundation's Group|21. Group|21 will bring together 21 philanthropists, each donating between $500,000 and $5 million. Grants, grassroots efforts, and matching-fund strategies will provide the remaining support. Genetic studies have thus far identified a limited number of loci associated with human longevity by applying age at death or survival up to advanced ages as phenotype. As an alternative approach, one could first try to identify biomarkers of healthy ageing and the genetic variants associated with these traits and subsequently determine the association of these variants with human longevity. In the present study, we used this approach by testing whether the 35 baseline serum parameters measured in the Leiden Longevity Study (LLS) meet the proposed criteria for a biomarker of healthy ageing. We have previously proposed four criteria for a quantitative parameter that, we think, need to be fulfilled before being considered a biomarker of healthy ageing. In short, a biomarker of healthy ageing should show an association with (1) chronological age, (2) familial propensity for longevity, (3) known health parameters, and (4) morbidity and/or mortality. Thus far, biomarker research has identified several potential biomarkers of healthy ageing, such as glucose and free triiodothyronine (fT3) serum levels, CDKN2A (p16) gene expression, leukocyte telomere length (LTL), and gait speed. By testing the four previously proposed criteria for biomarkers of healthy ageing in individuals from the LLS, we identified parameters involved in carbohydrate (glucose and insulin) and lipid metabolism (triglycerides) as biomarkers of healthy ageing. In addition, we showed that a relatively high proportion of the genetic variants previously associated with these parameters are also nominal significant in the largest genome-wide association study (GWAS) for human longevity to date. However, even in the largest GWAS for these parameters to date the explained variance is only 4.8% (glucose), 1.2% (insulin) and 2.1% (triglycerides), indicating that there is still a lot to discover. Nonetheless, we were able to find an enrichment of significant genetic variants, previously indicated to be involved in glucose, insulin and triglycerides regulation, in the longevity GWAS dataset. This indicates that the genetic component underlying these traits may also contribute to human longevity. Some birds have been found to be as intelligent as mammals. And some that can see ultraviolet (UV) light live in a super-sensory world apart, able to transmit and receive signals between each other in a way that is invisible to many other species. Now the ability of finches, sparrows, and many other birds to see ultraviolet (UV) light is explained in a study published in the journal eLife by scientists at the Washington University School of Medicine in St. Louis. The study reveals two essential adaptions that enable birds to expand their vision into the UV range: chemical changes in light-filtering pigments called carotenoids (such as carotene, found in carrots, associated with vitamin A) and the tuning of light-sensitive proteins called opsins (light-sensitive proteins), some of which are also used in optogenetics research. Birds acquire carotenoids through their diets and process them in a variety of ways to shift their light absorption toward longer (visible light) or shorter (UV) wavelengths. “There are two types of light-sensitive cells, called photoreceptors, in the eye: rods and cones. Cone photoreceptors are responsible for color vision. While humans have blue, green, and red-sensitive cones only, birds have a fourth cone type which is either violet or UV-sensitive, depending on the species,” says senior author Joseph Corbo, MD, PhD, Associate Professor of Pathology and Immunology. The study also revealed that sensitivity of the violet/UV cone and the blue cone in birds must move in sync to allow for optimum vision. Among bird species, there is a strong relationship between the light sensitivity of opsins within the violet/UV cone and mechanisms within the blue cone, which coordinate to ensure even UV vision. Taken together, these results suggest that both blue and violet cone cells have adapted during evolution to enhance color vision in birds. Birds have achieved UV vision by use of a specialized optical organelle, the pigmented cone oil droplet. These oil droplets are located in the path of light through the receptor and act as cutoff filters matched to the visual pigment sensitivity of each cone subtype. “The majority of bird species rely on vision as their primary sense, and color discrimination plays a crucial role in their essential behaviors, such as choosing mates and foraging for food. This explains why birds have evolved one of the most richly endowed color vision systems among vertebrates,” says first author Matthew Toomey, a postdoctoral fellow at the Washington University School of Medicine. The team now plans to investigate the underlying molecular mechanisms that help modify the carotenoid pigments and light-sensitive protein tuning in a wide range of bird species, to gather further insights into the evolution of UV vision. Color vision in birds is mediated by four types of cone photoreceptors whose maximal sensitivities (λmax) are evenly spaced across the light spectrum. In the course of avian evolution, the λmax of the most shortwave-sensitive cone, SWS1, has switched between violet (λmax > 400 nm) and ultraviolet (λmax < 380 nm) multiple times. 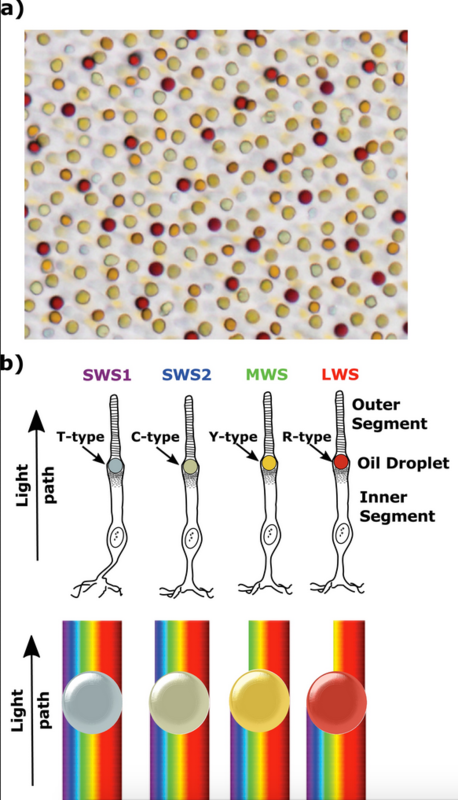 This shift of the SWS1 opsin is accompanied by a corresponding short-wavelength shift in the spectrally adjacent SWS2 cone. Here, we show that SWS2 cone spectral tuning is mediated by modulating the ratio of two apocarotenoids, galloxanthin and 11’,12’-dihydrogalloxanthin, which act as intracellular spectral filters in this cell type. We propose an enzymatic pathway that mediates the differential production of these apocarotenoids in the avian retina, and we use color vision modeling to demonstrate how correlated evolution of spectral tuning is necessary to achieve even sampling of the light spectrum and thereby maintain near-optimal color discrimination. University of Minnesota (UMN) scientists and associates have developed new technology that can detect signs of Alzheimer’s before the onset of symptoms — early enough to give drugs a chance to work — in mice and humans by simply examining the back of their eyes. Looking at Alzheimer’s effects through the eye is a key advantage of the new technology. “The retina of the eye is not just ‘connected’ to the brain — it is part of the central nervous system,” said Swati More, PhD, of the Center for Drug Design at UMN, co-author of a paper recently published in Investigative Ophthalmology & Visual Science (IOVS). Human clinical trials are set to start in July to test the technology in humans who are 40–75 years old (for more information on participating in the clinical trial, you can visit the trial website). Purpose: To describe a spectral imaging system for small animal studies based on noninvasive endoscopy of the retina, and to present time-resolved spectral changes from live Alzheimer’s mice prior to cognitive decline, corroborating our previous in vitro findings. Methods: Topical endoscope fundus imaging was modified to use a machine vision camera and tunable wavelength system for acquiring monochromatic images across the visible to near-infrared spectral range. Alzheimer’s APP/PS1 mice and age-matched, wild-type mice were imaged monthly from months 3 through 8 to assess changes in the fundus reflection spectrum. 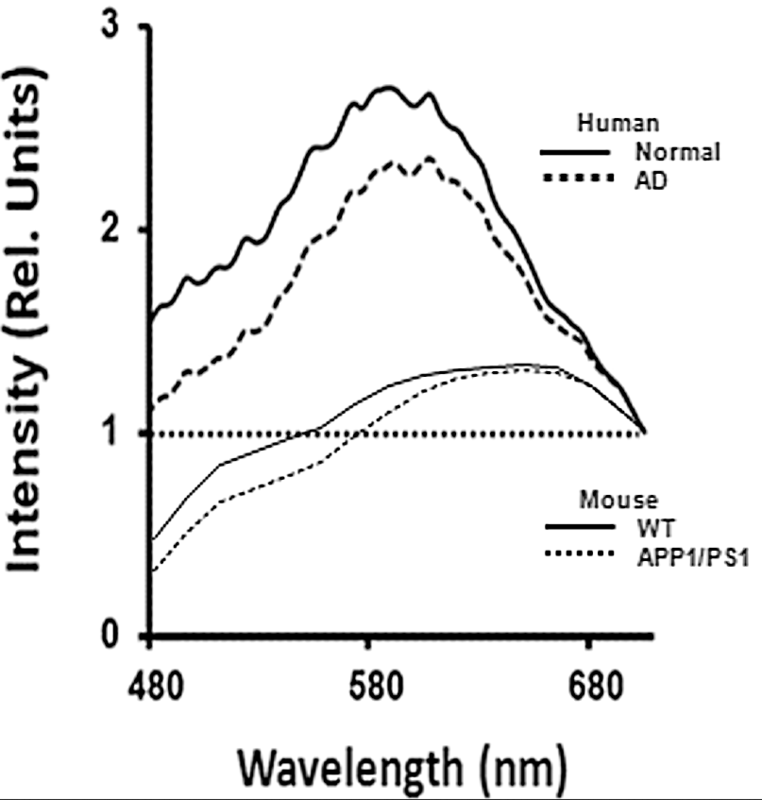 Optical changes were fit to Rayleigh light scatter models as measures of amyloid aggregation. Results: Good quality spectral images of the central retina were obtained. Short-wavelength reflectance from Alzheimer’s mice retinae showed significant reduction over time compared to wild-type mice. 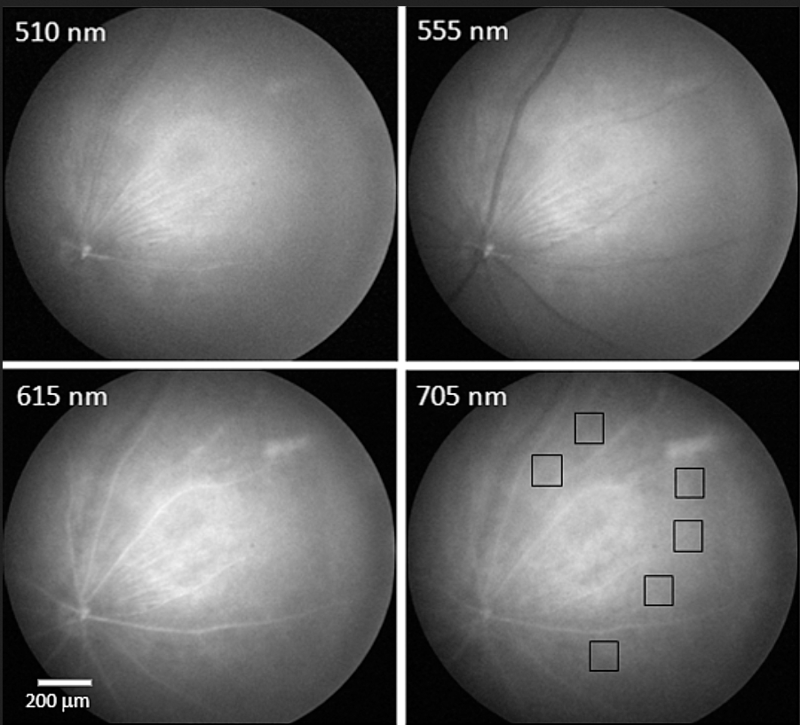 Optical changes were consistent with an increase in Rayleigh light scattering in neural retina due to soluble Aβ1–42aggregates. The changes in light scatter showed a monotonic increase in soluble amyloid aggregates over a 6-month period, with significant build up occurring at 7 months. Conclusions: Hyperspectral imaging technique can be brought inexpensively to the study of retinal changes caused by Alzheimer’s disease progression in live small animals. A similar previous finding of reduction in the light reflection over a range of wavelengths in isolated Alzheimer’s mice retinae, was reproducible in the living Alzheimer’s mice. The technique presented here has a potential for development as an early Alzheimer’s retinal diagnostic test in humans, which will support the treatment outcome.